The LMR and LPR Series magnetic non-contact safety switches with European industry standard fitting have been designed to enable the conformance to EN60947-5-3 and be used as directed by ISO12100, ISO14121 and EN60204-1. They have magnetic sensing which provides a wide sensing distance and provides a high tolerance to misalignment after sensing. They can operate from 4 directions even in extreme environments of temperature and moisture. 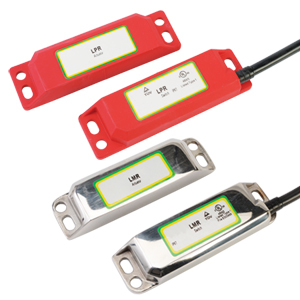 They have volt free high power switching capability and can be used independently to switch low risk applications or connect to a safety relay to provide higher safety levels. When used in combination with most dual channel safety monitoring relays they can be used to provide up to PLe/Category 4 to ISO13849-1. LMR and LPR Series magnetic non-contact safety switches are designed to interlock hinged, sliding or removable guard doors. LMR Series stainless steel safety switches have been designed for applications in the food processing, pharmaceutical, packaging and petrochemical industries. LPR Series switches have been developed for applications in general factory automation, packaging and some food processing industries. Note: All switches include actuator.